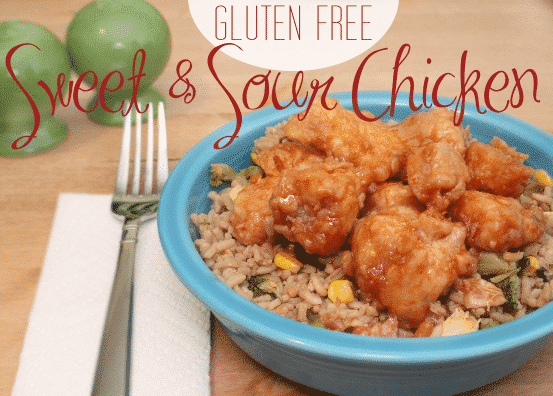 A few months back, I posted my gluten free chicken fried rice recipe, and this sweet and sour chicken recipe is a great way to spice up your fried rice. We eat fried rice for dinner all the time, so sometimes instead of making chicken or pork fried rice, I like to make this recipe to have with our rice. It’s easy to make (though it does take a little time), and it’s so delicious. My husband doesn’t always like having to eat gluten free, but he doesn’t even notice with this recipe. Preheat the oven to 375 degrees. Cube the chicken and set it aside in a large bowl. Mix the eggs and soy sauce together in a small bowl. Pour the egg mixture over the chicken and stir until covered. Then mix together the cornstarch, salt, and pepper and pour over the chicken. Stir until the chicken is well coated with cornstarch. Heat 1/4 cup of oil in a large skillet. Brown the chicken, but don’t cook it through. Once the chicken is browned, place it in a greased baking dish. Pour the sauce over the chicken evenly. Bake for one hour, and stir the chicken every 15 minutes. The sauce might not look quite right while it’s cooking, but don’t worry, it’ll look right when it’s done cooking. I usually use the time that it’s baking to cook up my fried rice and get together anything else we’ll need for dinner. Once it’s been in the oven for an hour, take it out and serve hot with fried rice. Enjoy! Cube the chicken and set it aside in a large bowl. Mix the eggs and soy sauce together in a small bowl. Pour the egg mixture over the chicken and stir until covered. Mix together the cornstarch, salt, and pepper and pour over the chicken. Stir until the chicken is well coated with cornstarch. Heat 1/4 cup of oil in a large skillet. Brown the chicken, but don't cook it through. Whisk together the sweet and sour sauce. Bake for one hour, stirring the chicken every 15 minutes. Serve with fried rice & enjoy! Yum! I have been looking for a sweet and sour chicken recipe lately but most of the ones I come across seem too difficult. This seems easy and tasty – looking forward to trying it. I’m not a fan of difficult recipes, so I made sure this one didn’t have too many steps! Let me know if you try it! I love Sweet & Sour Chicken. Can’t wait to give this a try! I’m glad there are so many more gluten free recipes out there now. Thanks for taking the time to put this chicken recipe together. My husband and I are both mostly gluten free now so every new recipe helps! There are a ton of great recipes online now, Danelle, it’s easy to find great gluten free meals. I have several other gluten free recipes on this site, and more recipes and product reviews over at my site, thehelpmates.com, you should check them out! this sounds amazing and I have been looking for new chicken recipes to try. Definitely going to add this to my “recipes to try” and see if the family likes it. Thanks for sharing! Thanks, Robyn! I hope you enjoy it! My hubby loves sweet and sour chicken. I really havent had it before, but it looks delicious! I’m always looking for new chicken recipes to try. We’re the same way, Amy. It’s always been a favorite of his, but I didn’t like it until I started making it myself. It’s really delicious! sweet and sour chicken is our fave Chinese American dish! Look forward to trying this! My girlfriend made this at a dinner party last year. It’s such an awesome recipe. Thank you so much for sharing at Simple Supper. We’ve made this several times, its quite a bit of work but definitely worth it. I made this the other day and my 12 year old son ate it as well..he loved it! He doesn’t like the store made gluten free foods and I don’t either so I try to make alot of my gluten free foods at home. This one is a keeper and I didn’t find it alot of work at all. Thanks so much for a great recipe. Cheers! Oops the soy sauce is NOT gluten free. My headaches and migraines didn’t go away until I cut that out too. Tamari is the gluten free version made with only soy. Soy sauce is a combo of soy and wheat. Your recipe looks great, I can’t waIt to try it! Thanks! Thanks for the information! Good to know. Kikkoman makes a really good GF soy sauce! I think they also make Teriyaki. I buy mine at Safeway, check it out! Soy sauce is not gluten free. So, not sure how exactly this is considered gluten free? Hi Marlo! There are actually a few soy sauces available that are gluten-free. Kikkoman has a gluten free soy sauce, as an example.